Nominations are now open for this year’s Breast Friend Award. 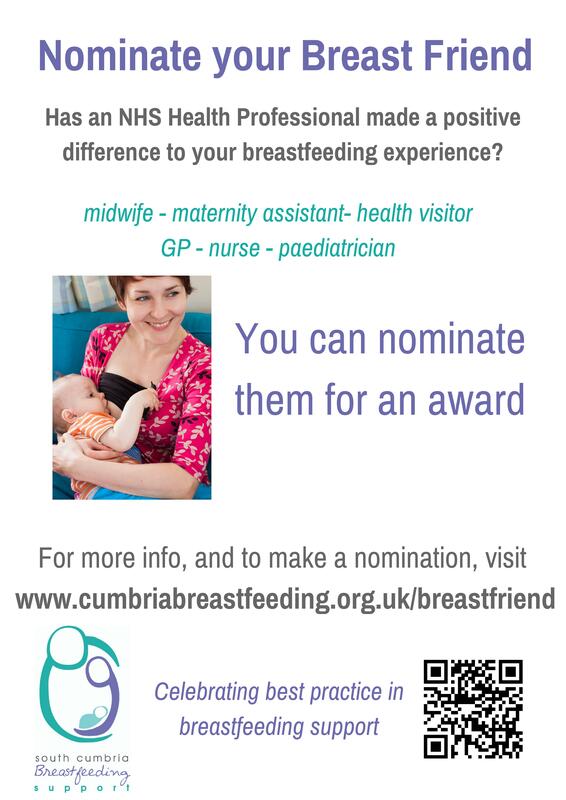 This award is made to an NHS Health Professional who has made a significant positive difference to the breastfeeding experience of mothers in South Cumbria. We love to hear good news stories, and to publicise good practice, so please nominate your NHS Breast Friend using our simple nomination form. If you hear a mum or dad talking about how an NHS Health Professional gave them great support or encouragement, please tell them about the award. There is no limit to the number of nominations you can make, so feel free to nominate several Health Professionals if you’d like to.